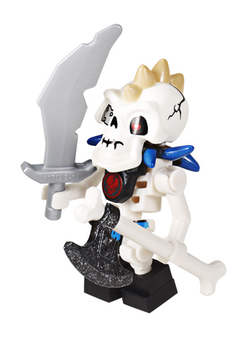 Skulkins are the Ninjago ninja's main enemies in 2011. They also appear as enemies in the LEGO Universe video game. In the Ninjago storyline, they are known as Skeletons; however, in the LEGO Universe Ninjago story and on LEGO.com, they are known as Skulkins. They were replaced by the Serpentine in 2012. However, they return in the episode All of Nothing in Rise of the Snakes to battle the Serpentine. In the Ninjago story, they were called skeletons, but have also been referred to as Skulkins in places such as LEGO Battles: Ninjago. They are enemies of the ninjas. Samukai, a four armed skeleton and puppet King of the Underworld, uses his Skulkin army to help Sensei Wu's evil brother Lord Garmadon, the true King of the Underworld, to steal the weapons of Spinjitzu and use their power to reshape the world of Ninjago. Skulkin also appear in LEGO Universe, which takes place after the main story of Ninjago. According to in-game scrolls, after Kai, Cole, Jay, and Zane recovered the Golden Weapons, they	returned to the Monastery. In pursuit of the weapons, the Skulkin attacked, and while the four ninjas were able to escape with the Golden Weapons, the Skulkin destroyed the walls of the Monastery with their machines. Sensei Wu then used his powers to steer the last remaining piece of the Monastery away from the world of Ninjago, and towards the last shard of pure Imagination on Crux Prime. However, the Skulkin followed close behind, and set up a mining quarry nearby the Monastery on Crux Prime. There, they found that they could use Maelstrom ore in the ground to protect themselves from Spinjitzu, and quickly went to work mining the rocks. Sensei Wu then sends the player on a number of missions to defeat the Skulkins, such as smashing the miners or destroying their drilling rigs. Later, the Ninjago World was introduced to LEGO Universe, in which the Skulkin were besieging the Monastery. Players had to destroy their equipment and Skulkin, then venture into the caves, where four named Skulkin had gotten hold of the four golden weapons. A series of four Ninjago Dungeons, one for each element, were going to be released for LEGO Universe, with Garmadon as a boss at the end, but LEGO Universe was cancelled and the dungeons were never released. The skeleton in the Pirates of the Caribbean set 4195 Queen Anne's Revenge has a Skulkin torso. Except for Wyplash and Samukai, all of the Skeletons make cameos in Season 1 of Ninjago: Masters of Spinjitzu. This page was last edited on 10 January 2016, at 00:34.